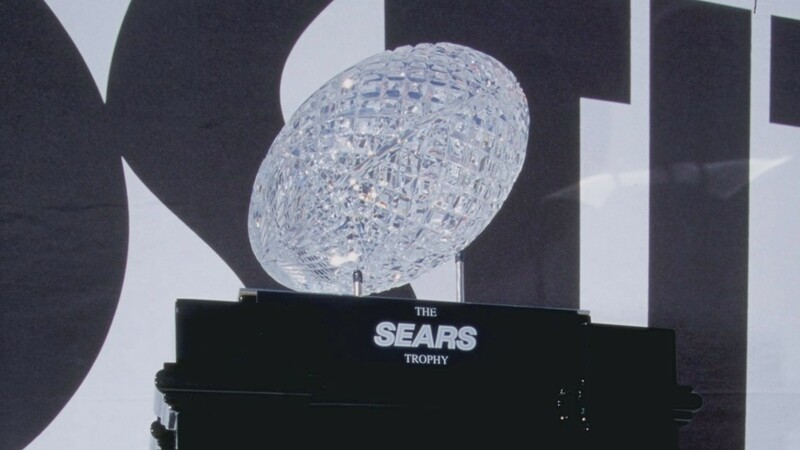 4 Jan 1999: A picture of the National Champion Trophy for the winner of the Tostitos Fiesta Bowl Game with the Tennessee Volunteers against the Florida State Seminoles. The Volunteers defeated the Seminoles 23-16. 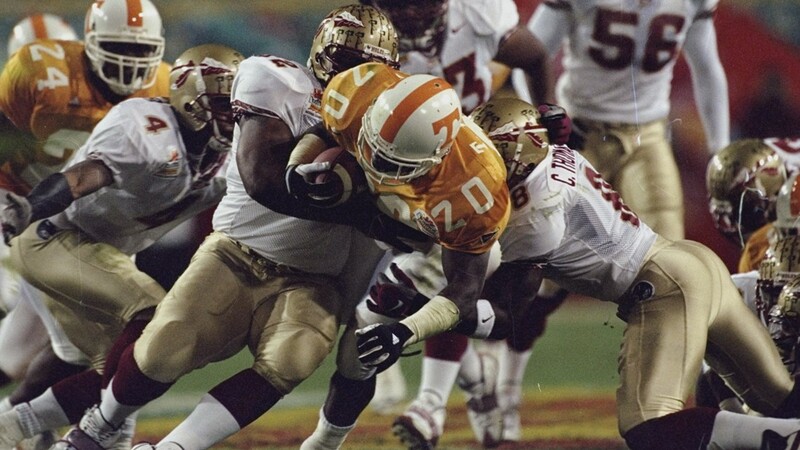 4 Jan 1999: Travis Henry #20 of the Tennesse Volunteers carries the ball during the Fiesta Bowl Game against the Florida State Seminoles at the Sun Devil Stadium in Tempe, Arizona. 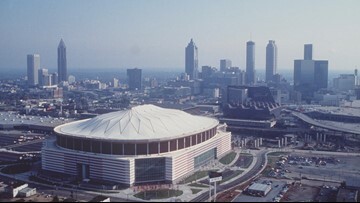 Tennessee defeated Florida State 23-16. 4 Jan 1999: Marcus Outzen #14 of the Florida State Seminoles in action during the Fiesta Bowl Game against the Tennesse Volunteers at the Sun Devil Stadium in Tempe, Arizona. 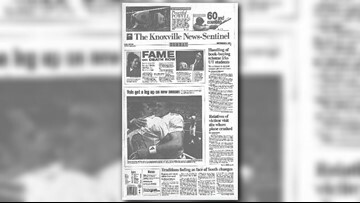 Tennessee defeated Florida State 23-16. 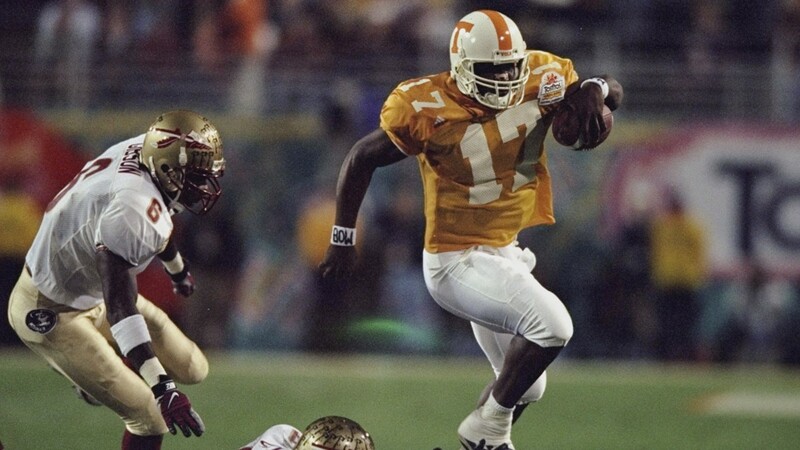 4 Jan 1999: Tee Martin #17 of the Tennesse Volunteers carries the ball during the Fiesta Bowl Game against the Florida State Seminoles at the Sun Devil Stadium in Tempe, Arizona. 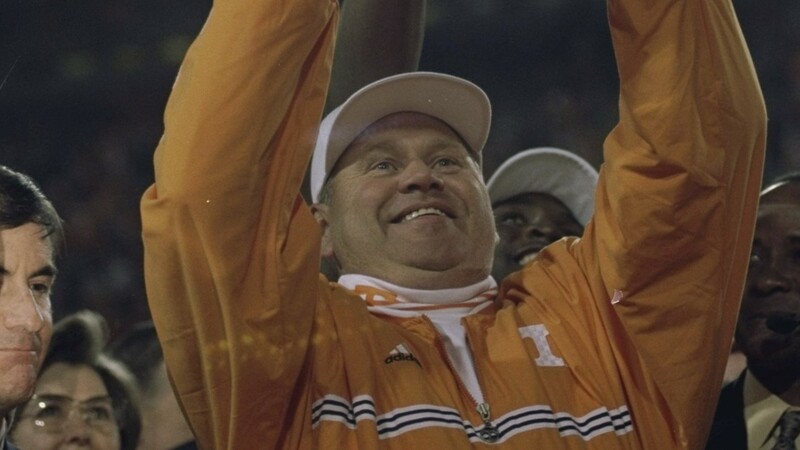 Tennessee defeated Florida State 23-16. 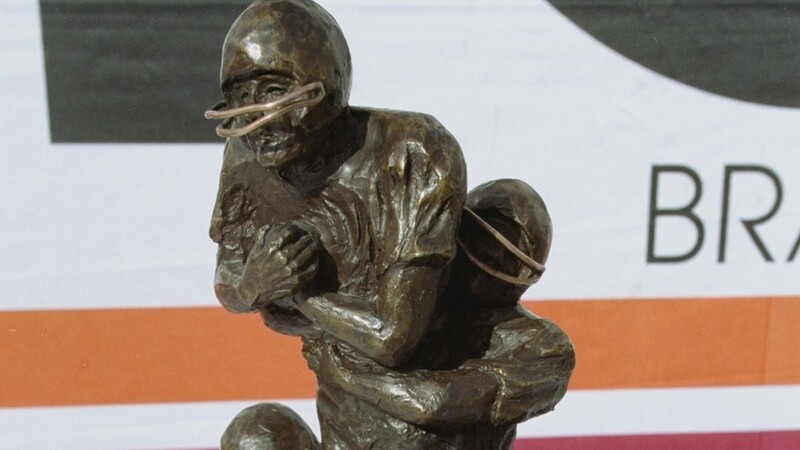 31 Dec 1998: A view of the Tostitos Fiesta Bowl Trophy taken during the Fiesta Bowl Game between the Florida State Seminoles and the Tennessee Volunteers at the Sun Devil Stadium in Tempe, Arizona. The Volunteers defeated Seminoles 23-16. 4 Jan 1999: Peerless Price #37 of the Tennesse Volunteers makes the catch during the Fiesta Bowl Game against the Florida State Seminoles at the Sun Devil Stadium in Tempe, Arizona. Tennessee defeated Florida State 23-16. 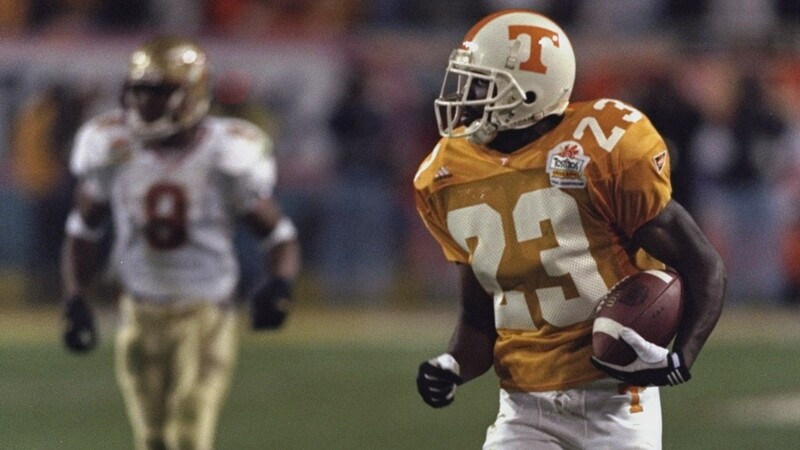 4 Jan 1999: Dwayne Goodrich #23 of the Tennessee Volunteers running back an interception for a touchdown during the Tostitos Fiesta Bowl Game against the Florida State Seminoles. The Volunteers defeated the Seminoles 23-16. 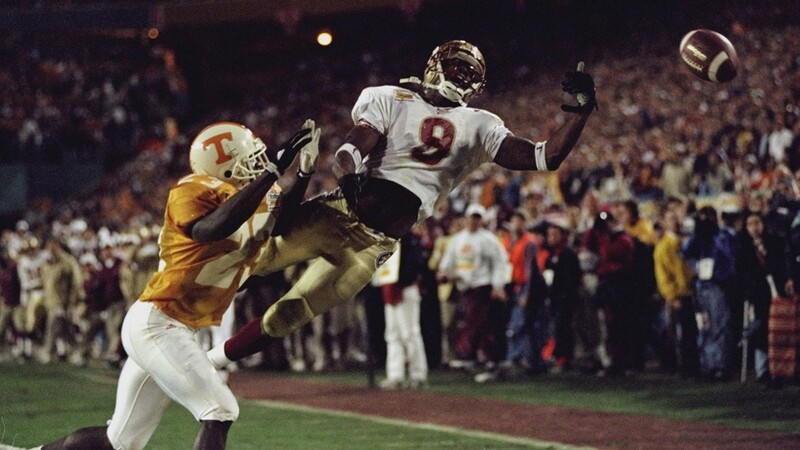 4 Jan 1999: Peter Warrick #9 of the Florida State Seminoles in action during the Fiesta Bowl Game against the Tennesse Volunteers at the Sun Devil Stadium in Tempe, Arizona. 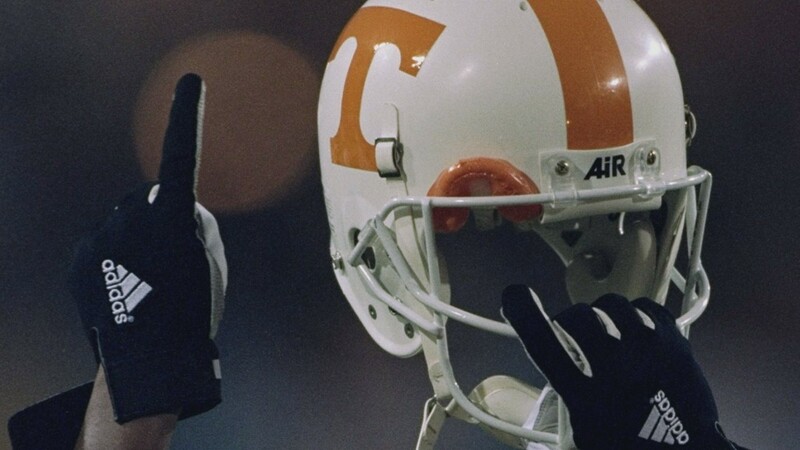 Tennessee defeated Florida State 23-16. 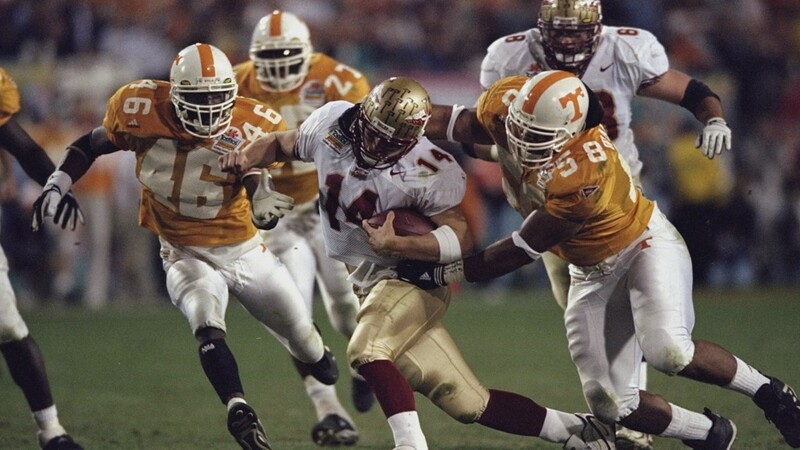 4 Jan 1999: Peter Warrick #9 of the Florida State Seminoles trying to catch a pass with Steve Johnson #34 trying to stop him during the Tostitos Fiesta Bowl Game against the Tennessee Volunteers. The Volunteers defeated the Seminoles 23-16. 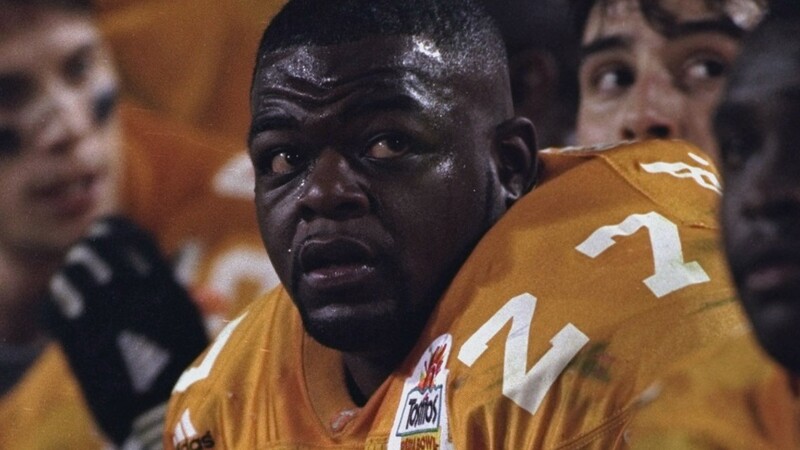 4 Jan 1999: Steve Johnson #34 of the Tennessee Volunteers catching the ball while Laveranues Coles #7 falls to the ground during the Tostitos Fiesta Bowl Game against the Florida State Seminoles. The Volunteers defeated the Seminoles 23-16. 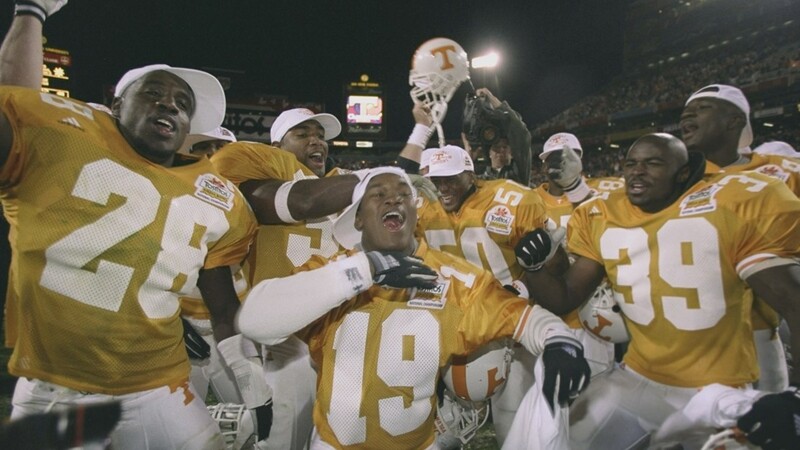 4 Jan 1999: the Tennesse Volunteers celebrate during the Fiesta Bowl Game against the Florida State Seminoles at the Sun Devil Stadium in Tempe, Arizona. Tennessee defeated Florida State 23-16. 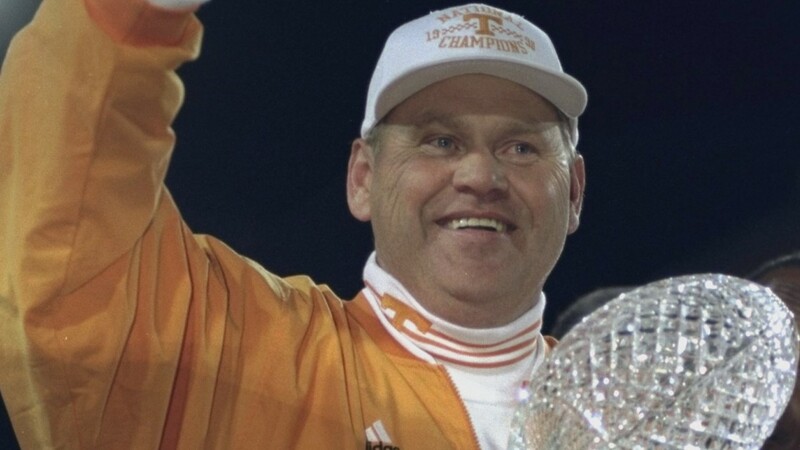 4 Jan 1999: Head Coach Phillip Fulmer of the Tennessee Volunteers excepting an award after the Tostitos Fiesta Bowl Game against the Florida State Seminoles at the Sun Devil Stadium in Tempe, Arizona. The Volunteers defeated the Seminoles 23-16. 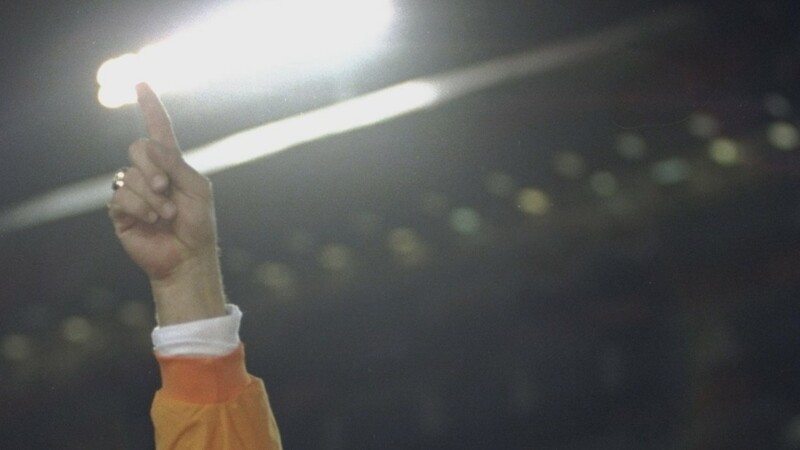 4 Jan 1999: Head coach Phil Fulmer of the Tennesse Volunteers holds up the trophy during the Fiesta Bowl Game against the Florida State Seminoles at the Sun Devil Stadium in Tempe, Arizona. Tennessee defeated Florida State 23-16. 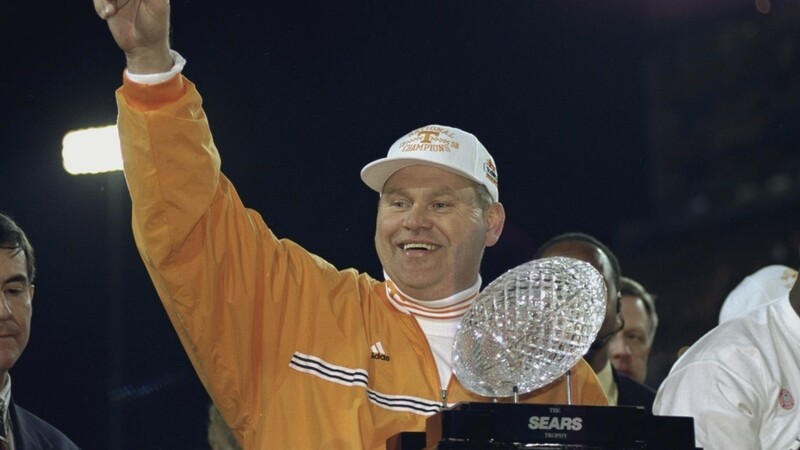 4 Jan 1999: Head Coach Phillip Fulmer of the Tennessee Volunteers accepting an award after the Tostitos Fiesta Bowl Game against the Florida State Seminoles at the Sun Devil Stadium in Tempe, Arizona. The Volunteers defeated the Seminoles 23-16. 4 Jan 1999: Kevin Taylor #86 of the Tennesse Volunteers celebrates during the Fiesta Bowl Game against the Florida State Seminoles at the Sun Devil Stadium in Tempe, Arizona. Tennessee defeated Florida State 23-16.